27th August 2011 - a garden fete was held within the grounds of St Mary's, to raise funds to further develope facilities in the Centre. The aim is to install a shower room in the downstairs toilet, enabling less able bodied people come to enjoy the area and partcipate in retreats or hoildays. The fete proved to be a resounding success, raising in excess of £1,000. Congratulations are extended to all who helped make the afternoon so successful. 1st September 2011 - Bridge Night, held in Dumfries. Once your on a roll!!! 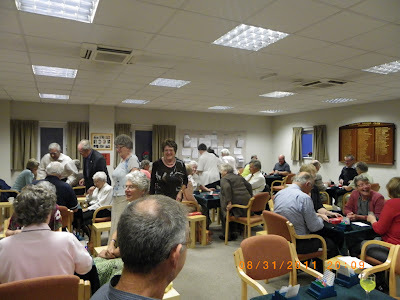 fifteen tables of players enjoyed an evening of Bridge, again to raise funds for the 'Thomas Bagnall Centre' A wonderful buffet was provided by the members of the club. An array of raffle prises were donated and our thanks go to all concerned who either helped in the kitchen or donated prises or even took their chance on the table! In total after expenses, we raised a further £406 toward the shower room.